SMS information system: Outlier purchases opt-in cell phone numbers from a company called Exact Data. In the past, you might have given your number to a company they represent. Your access to and control over information: You may opt out of any future contacts from us at any time. Text STOP to 73224. Standard messaging rates apply. Your information: We are the sole owners of the information collected on this site and through our text service. We will not sell or rent this information to anyone. We will use your information to respond to you, regarding the reason you contacted us. With your permission, we may follow up with you to share valuable journalism with you, or to share your story with a journalist covering housing and utilities issues. Security: We take precautions to protect your information. If you were ever to submit sensitive information to Outlier, your information is protected both online and offline. Facebook Messenger app: If you are using Outlier through Facebook Messenger, please know that we are not collecting information about you other than information you send directly to us. Shortcode information: All Outlier services are originated from shortcode 73224. Service/help info: Contact Outlier Media with any questions. Text FOLLOW UP or email info@outliermedia.org. Data will be updated every few months. Each city agency updates its data on a different schedule. Rental registration and inspection data does not include public housing units. 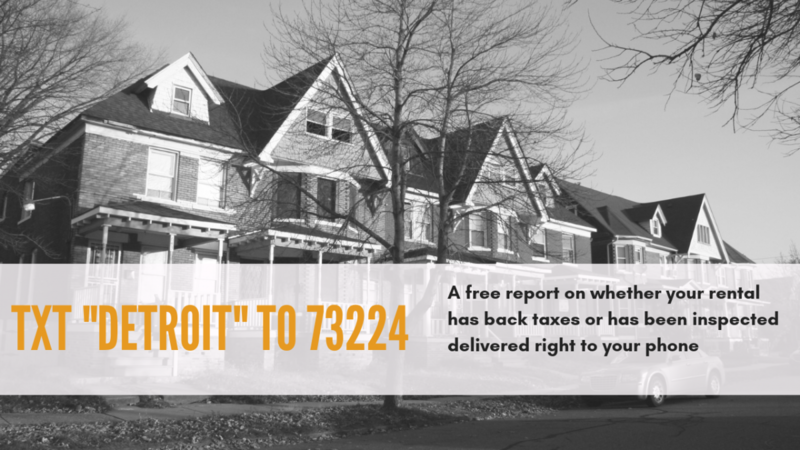 The Detroit Open Data Portal listed 664 addresses as having a zip code of 48200, a zip code that does not in fact exist. Those addresses were looked up in Google Maps and the zip code listed there replaced the 48200 zip for all 664 addresses. Housing paid for with the federal Housing Choice Voucher Program does not have a pass/fail inspection system. The Detroit Department of Water and Sewerage denied a FOIA request for specific address level information of water bill delinquency or water bill payment plans. The department did however provide partially redacted address information and the zip code. Outlier then requested a list of all the water customers in Detroit and the zip codes associated with those customers. Outlier compared the total count of all water customers in a particular zip code and the count of all delinquent or payment plan customers within that zip code to get the percentage of addresses within each zip code at risk of shut off.